The mesmerizing beauty of nature shines through every detail on these stunning yet simple wedding invitations. Delicate, gold foil ferns sparkle around your wording. Your wording is printed in your choice of color and fonts. Ecru inner and outer envelopes are included. These wedding invitations feature thermography printing. Thermography is a unique printing technique that results in raised lettering you can feel, which adds to the luxurious experience of this printed piece. So much more beautiful than I expected. Quality quality quality. Order arrived quickly and everything in PERFECT condition. Beyond satisfied that I chose Invitations by Dawn. Will recommend to all. 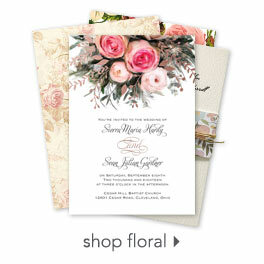 This invitation was perfect for my outdoor, botanical garden wedding! 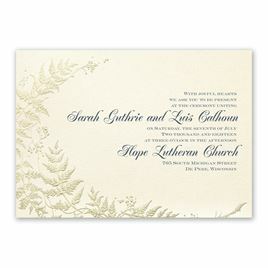 It has all over subtle shimmer and the gold foil ferns add an element of elegance! The design is versatile in that it can be for a really simple outdoor wedding or an extravagant and formal wedding. I was happy to customize the font and font color. These cards are amazing and they look very elegant in person. The gold is foil pressed and the writing is thermography. The ferns are beautiful and represent one of the oldest plants, dating back to the dinosaurs. It offers a classic look. We had used the Center alignment because that worked better with our wording. It turned out more formal with a centre alignment. We had to use parents inviting verses. The envelopes were great too. We got guest addressing and I had to request the addresses be larger print. I still wish they had been more in the centre of the page. Overall great. Used the online chat, easy and efficient. Very helpful. Also purchased proof, wish it was free. But I was able to have some adjustments made to the guest printing. Arrived in a timely manner, ordered 2 day air shipping and received them 7 days from ordering. (Included a weekend).